Originated with the University of Saskatchewan, by Dr. C. F. Patterson, selected in 1945, tested as A55-101, and introduced in 1959. The tree is vigorous, with good branching habit, a heavy bearer, and annually productive It is hardy to Zone 1, and susceptible to fire blight. 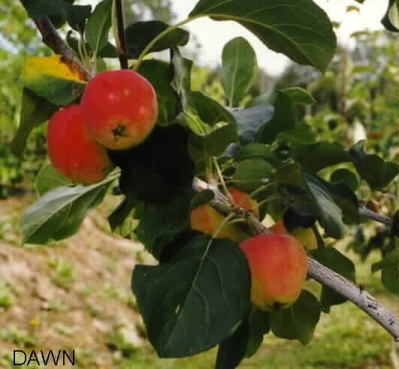 The fruit is 4.0 - 4.5 cm (1 3/4 - 1 7/8") in diameter, round conic, and matures in late July to early August. The skin is thin, light cream base and well covered with light crimson. The flesh is creamy white to yellowish, mildly acid, with a pleasant flavour. It is good for fresh eating and for cooking, but it stores very poorly.